The sixth King of Portugal. 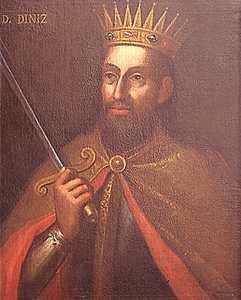 Son of King Afonso III and D. Beatriz of Castille, born on October 9th, 1261 he died in Santarém on January 7th, 1325. Crowned in 1279, had one of the longest reigns, lasting 46 years. He was responsible for important reforms in medieval Portugal given his intelligent character. He also put a stop to the privileges that undermined the regal authority and in 1282 established that all judicial appeals could only go through the Crown and Courts. In 1284, regal hearings were held. In them one finds statements regarding the foundation of the Tomar castle and village and the populating of the region by Knights Templar dating back from the time of King Afonso Henriques. When he rose to power Portugal had litigation with the Holy See linked to the abuses of the clergy in terms of royal property. King Dinis established a concordat after which all disputes were to be dealt with by the king with the clergymen. He supported the Portuguese knights of the Order of Santiago who wished separation from their Castilian master. When Pope Clement V abolished the Knights Templar, King Dinis did not implement the pontiff´s order for imprisoning the Knights for questioning and to deliver all their assets to the Hospitallier Order. He held talks with the Holy See and obtained, in 1319, the bull which decreed the creation of the Militia of Knights of Our Lord Jesus Christ where all Knights Templar and assets were integrated. He founded the Portuguese navy in 1312 and was the major driving force behind naval construction - even though it was in agriculture, whose exploitation was mainly in the hands of religious orders, where he looked so as to involve his people and as a result expedited the distribution of properties namely by creating new settlements. He covered cities and villages where he strengthened regal rights, made sure justice functioned and organized defences in all districts. He also developed market fairs, protected the export of agricultural goods to Flanders, France and England with whom he established a treaty in 1308. These transactions also included salt and salted fish. King Dinis also boosted silver, tin and iron mining demanding in return a fifth of the ore and a tenth of pure iron. He was also a major driving force for national culture - the Priveligiorum Magna Carta was the first University status and resulted in a great number of texts being translated. His court was one of the most notable literary centres of the Peninsula.